The Pittsburgh Chapter of Women’s Transportation Seminar (WTS) selected Jane-Ann Patton, senior project manager located in Lochner’s Pittsburgh office, for the WTS Innovative Transportation Solutions Award. WTS is an international organization dedicated to the advancement of women in the transportation industry and recognizes Jane for her project management role on the I-79 Bridge Replacement project in the Pennsylvania Department of Transportation’s (PennDOT’s) District 10. As project manager on the I-79 Bridge Replacement project, Jane led the team that addressed the rapidly deteriorating condition of I-79’s dual, three-span concrete slab structures on an accelerated schedule. 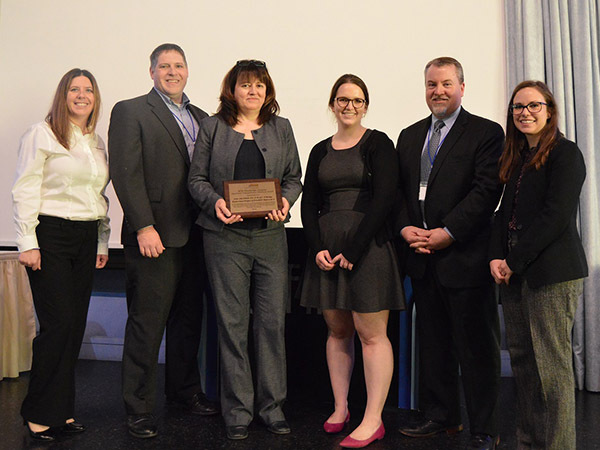 This team showcased Lochner women in prominent project roles—including Kelly Rigot, Mallory Burke, Claire McGinnis, and Pam Housley (pictured)—and worked collaboratively with subconsultants and PennDOT staff to allow for quick review times and effective decision making. This partnership, facilitated by Jane, moved the project from the study phase to design completion in just nine months (March 2018 to January 2019) and led to innovative design solutions, including the accommodation of all project activities within existing right of way so no additional permanent right of way or temporary construction easements were necessary. Because of Jane’s effective project management on the I-79 Bridge Replacement project, Lochner strengthened working relationships between the team and client and implemented innovative solutions to achieve the timely replacement of I-79’s bridges.